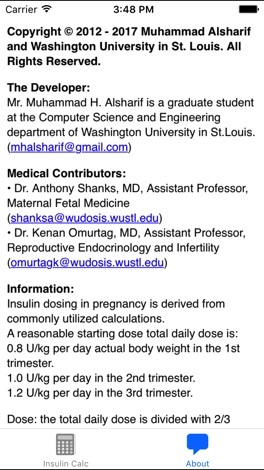 2014 - Muhammad Alsharif and Washington University in St. Louis. All Rights Reserved. 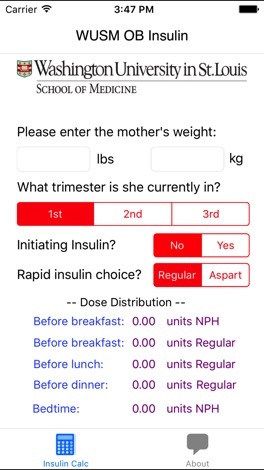 The developer grants permission to use and reproduce the OBInsulin exactly as it appears here without modification or editing of any kind solely for end user use in clinical care or research in clinical care or research (the “Purpose”). For the avoidance of doubt, the Purpose does not include the (i) sale, distribution or transfer of the OBInsulin or copies thereof for any consideration or commercial value; (ii) the creation of any derivative works, including translations; and/or (iii) use of the OBInsulin as a marketing tool for the sale of any drug. THIS SOFTWARE IS PROVIDED BY THE COPYRIGHT HOLDERS AND CONTRIBUTORS \AS IS\ AND ANY EXPRESS OR IMPLIED WARRANTIES, INCLUDING, BUT NOT LIMITED TO, THE IMPLIED WARRANTIES OF MERCHANTABILITY AND FITNESS FOR A PARTICULAR PURPOSE, OR THAT THE USE OF THE SOFTWARE WILL NOT INFRINGE ANY PATENT COPYRIGHT, TRADEMARK, OR OTHER PROPRIETARY RIGHTS ARE DISCLAIMED. IN NO EVENT SHALL THE COPYRIGHT HOLDER OR CONTRIBUTORS BE LIABLE FOR ANY DIRECT, INDIRECT, INCIDENTAL, SPECIAL, EXEMPLARY, OR CONSEQUENTIAL DAMAGES (INCLUDING, BUT NOT LIMITED TO, PROCUREMENT OF SUBSTITUTE GOODS OR SERVICES; LOSS OF USE, DATA, OR PROFITS; OR BUSINESS INTERRUPTION) HOWEVER CAUSED AND ON ANY THEORY OF LIABILITY, WHETHER IN CONTRACT, STRICT LIABILITY, OR TORT (INCLUDING NEGLIGENCE OR OTHERWISE) ARISING IN ANY WAY OUT OF THE USE OF THIS SOFTWARE, EVEN IF ADVISED OF THE POSSIBILITY OF SUCH DAMAGE. Gabbe SG, Graves CR. 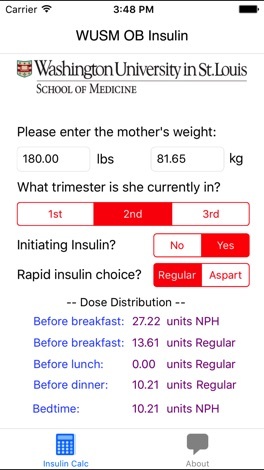 Management of diabetes mellitus complicating pregnancy. Obstet Gynecol 2003;102:857068. Langer O, Anyaegbunam A, Brustman L, Guidetti D, Levy J, Mazze R. Pregestation diabetes: insulin requirements throughout pregnancy. Am J Obstet Gynecol 1988;159:616-21. ACOG Practice Bulletin. Gestational Diabetes. Number 137, August 2013.